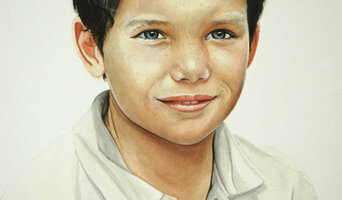 I paint portraits and still life in oil and watercolour . I also paint and draw the figure in pastel. Most of my portrait work is from commissions. I sell prints and originals of my work. Ruth completed a foundation course in Art and Design at Oxford Polytechnic and then went on to study Graphic Design and Illustration at Bristol Art College where she graduated in 1985. She worked as an Art Director in advertising with several leading agencies in London until 1991 when she began her new career as a professional artist and illustrator. As an illustrator she has had many of her book covers published. As a fine artist she has had numerous commissions and several successful exhibitions. Her portrait of her grandmother was shown at The Royal Society of Portrait Painters in the Mall Galleries. Whilst living and working in Hong Kong, Ruth has concentrated on exhibiting her work and building a very successful business in fulfilling commissions for portraits from the UK, Australia, U.S.A and Hong Kong. 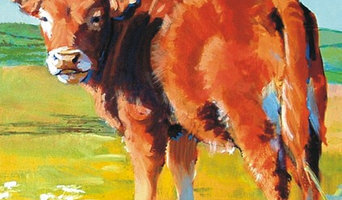 Ruth is now based in Oxfordshire, England where she works from her studios in Sutton Courtenay. 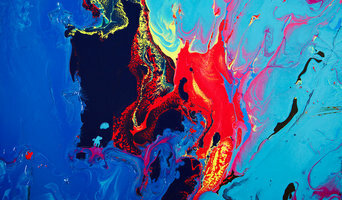 Lynda is an Award Winning abstract artist working in acrylics, Resin and glass to produce vibrant, colourful and often highly textured abstracts and seascapes; she has also won two 'Special Recognition' awards in 2016 for her drawings of endangered and illegally poached wild animals. We are a London based arts consultancy founded to represent original, emerging and established British based artists. By working with artists directly from their studios, we have a portfolio of innovative exciting art for you to choose from. In addition you can commission original art works for your space and projects. Through our close working relationship with artists we ensure a stand out collection of art to choose from at any time. Luminaire Arts has built a portfolio of carefully selected original artworks, across a wealth of mediums including painting, sculpture, 3D art, ceramics and photography. Our gallery can also be found at Belgravia, London where all our artwork is on display. Enhance any room of your home with a unique image from an independent fine artist with 25 years professional experience working on a wide range of projects. I am an artist and illustrator based in rural Herefordshire, UK, creating personalized illustrations, vintage inspired prints with a contemporary twist and customised typographic art. I work with clients to produce artwork designed for them and I also have a large selection of ready to purchase prints. Custom paintings for residential and corporate spaces. Original artwork also for sale through the Art Agency in Esher, Surrey and JCO's Art Haus in Los Gatos, California. International Art Gallery, Bespoke Picture Framers and Art Consultancy. Established by Gallery owner and Framer, Soo Turner and International Artist Natasha Barnes, the Gallery brings a combined knowledge of over 40 years in the art business. Turner Barnes Gallery has two gallery spaces in Essex represented both emerging and established artists from around the World, hosting Pop-Up exhibitions in London, working as curator on exhibitions in Europe and exhibiting at Art fairs in the US and Asia. Our Art Consultancy service offers a home advisory service to try art in your home before you buy, ensuring that you love the piece and it is hung in the most complimentary space to show the work off at it's best. In addition to the extensive art portfolio available through our Galleries and website, our experience allows us to access an international network of Artists. Our picture framers Interior Angle was established in 1994 which has been framing for individuals, artists, galleries, photographers and interior designers ever since. All work is undertaken by the highly experience team located in the workshop adjoining our Chelmsford gallery. We provide a wide range of framing services with acrylic box frames, oversized frames, restoration/conservation/museum standard framing, hand finished frames and specialist design services. In addition we design and give advice on bespoke mirrors. Soo is always on hand to offer expertise & advice for your art collection and framing. AllORA boasts a wide range of lovingly hand-woven fabrics, rustic artisanal ceramics, fine natural linens, hand-blown glassware and much, much more. The exclusive creations found within the AllORA collections are nothing less than the pinnacle of traditional rustic craft used with stylish, contemporary design. The combination of master craftsmanship and labour-intensive practices that goes into the production of our pieces ensures that each product is entirely unique. Individual brushstrokes and fine hand-stitching set the creations we carry apart from anything you'll find elsewhere. Each piece is original, unique and a one off. My creative process is exploring the inner and the outer self, contradictory aspects of life and the subjectivity of experience. Something a little different, Geoff Barker Artist I am an exciting new contemporary artist and have brought on to the scene a vibrant and interesting selection of colourful impactful contemporary art that will comfortably sit and enhance your home or business space. The colours and shapes of the art merge and blend to create eye-catching artworks that one could simply dive in and disappear through its detail colours shapes and form. I am inspired by my love of nature and the great outdoors, this combined with a graphic design background allows me to mix a multitude of mediums like oil, water and resin, to create stunning images that really do stand out from the crowd. 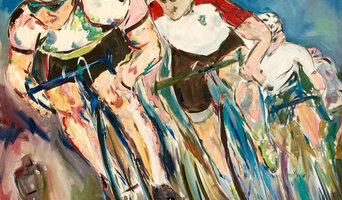 You will find 20 exciting artworks from my first collection on my website www.geoffbarkerartist.co.uk. These are limited edition prints and hand signed with a numbered certificate of authenticity, ranging in size from small, medium, large and really big, all printed on quality multi-layer coated, satin high white paper at 220 mic. Bespoke artworks can also be created to compliment an existing room décor. These impressive prints can be either dispatched carefully rolled in a substantial tube or alternatively, a high end bespoke framing service (framed by the Artist) is available allowing me to offer a further twinkle out of my creative eye. Born in Dublin in 1965, Leo travelled to England to study art in 1974. Following a Foundation Course at the Wirral Metropolitan College, he went on to obtain a BA(Hons) degree at John Moore’s University, Liverpool. More recently he has studied at the Slade School of Art in London. Leo works from his studio in Shropshire, painting in many media and designing for clients. He collaborates with interior designers on projects ranging from small trompe l’oeil to large scale murals - the largest being 72 ft by 7 ft around a private swimming pool. 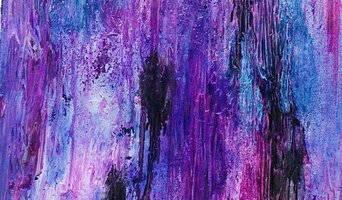 His painting is informed by everything that in some way provokes the senses. He expresses this by drawing and sketching small thumb nails. He then likes to ‘grow the work’ in scale. In some cases a word, or a split-second thought while reading, is conveyed into paintings. ‘The Old Man and the Sea’ by Ernest Hemmingway provided such inspiration for a collection of paintings and drawings. This was also linked to time spent by the sea in Anglesey, North Wales and childhood experiences in Ireland. At times in life ones spirituality is awakened and, at others, it is completely dormant. Leo is never really sure how these ‘fleeting moments’ are going to be expressed in his work until he starts to put paint to canvas.